Cap’n Jazz have reunited once again in 2017, having last done so in 2010 (both of which shows we covered ). If you’re not aware of the band, they’re more or less the godfathers of the so-called “emo” genre, spawning not only a wave of spinoff bands, but many imitators. With only one record to their name, the easiest point of entry is the Analphabetapolothogy compilation, first released in 1998. This show at Brooklyn Steel, billed as the band’s last U.S. reunion show (for now) was a freewheeling, crazy-making night of almost compulsive stage diving, silly stage banter, and rapid-fire delivery of the band’s favorites (plus that A-ha cover there near the end). If you had said to me prior to this night that Cap’n Jazz are more popular than ever, I’m not sure I’d have believed you, but the full floor at this massive venue (compared to sub-1000 capacity Brooklyn Bowl and sub-500 capacity Maxwell’s seven years ago) more than made the point. 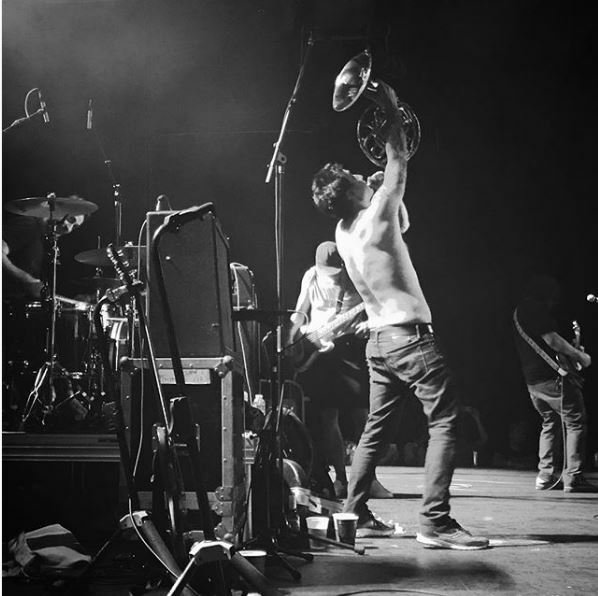 This was a show that put enthusiasm and energy first; if the band’s all-out delivery and Tim Kinsella’s shirtless stage diving didn’t necessarily mean he hit every lyric or the band hit every note, it couldn’t have mattered less. If later iterations of this style were criticized for being overly self-serious, they didn’t learn that from the brothers Kinsella and the current Cap’n Jazz crew (Victor Villarreal, Sam Zurick and Nate Kinsella), who put together a stage show that was really a show, the kind of experience fans want on a Saturday night. As Kinsella fumbled through a semi-serious cover of A-ha’s “Take On Me,” followed by the relentless closer “Ohh, How I Love You,” it felt like the right kind of sendoff before this pathbreaking band heads to Europe. This may have been the “last U.S. show” of this reunion, but no doubt we haven’t seen the last of these musicians, in one format or another. I recorded this set with Schoeps MK41V supercardiod microphones at the soundboard, adding a pair of Audio Technica 853 shotgun microphones to add in a bit more direct sound. The sound quality is excellent. Enjoy!